Fresno Yosemite International Airport. Beginning April 27, the airline will increase non-stop service to Denver from three flights to four flights a week. Frontier will periodically offer five flights a week between April 27 and September 30. Frontier Airlines entered the Fresno market in May 2013 providing non-stop air service to Denver three times a week operating an Airbus A319 aircraft with 138 seat capacity. The expanded flight frequencies on Frontier represent a 36% increase in seats to Denver and beyond. The additional seats are being offered at competitive fares through Fresno Yosemite with non-stop service to Denver for as low as $83 each way. In addition to non-stop air service to Denver, Frontier offers convenient connectivity to other popular domestic and international travel destinations. 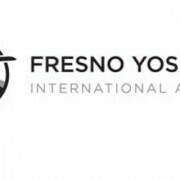 10 carriers currently offer Valley passengers approximately 42 daily domestic and international departures from Fresno to 12 non-stop destinations with one-stop service to 242 unique destinations in the U.S. and 74 international destinations covering five continents.